High turnover requirements for bonuses. 10Bet has been on the sportsbetting market for almost 15 years now. They launched in 2003 and are known for some highly competitive odds. 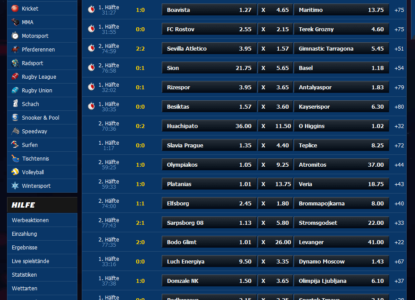 On some markets you will find the best odds, which makes 10Bet a good place for every sportsbetter. They are offering around 12,000 unique events through a lot of different markets. 10Bet operates in more than 90 countries and is owned by the Ocean Star Limited with a license from the Malta Gaming Authority. 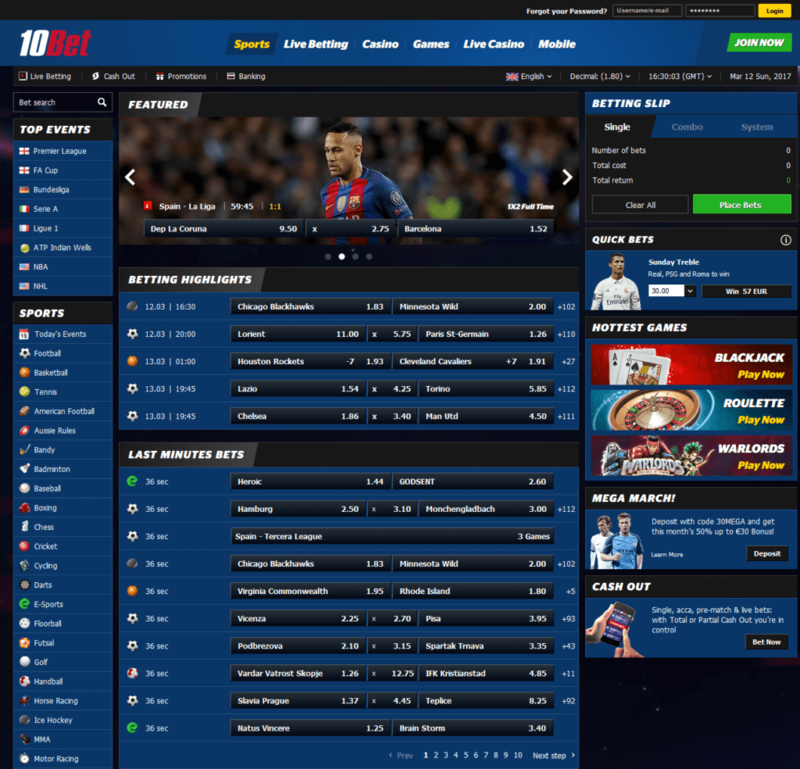 Find everything you need to know about 10Bet in our detailed review below. New customers can claim a 100%, up to €100 welcome bonus. To get the 10Bet bonus you just need to use our sign-up link above and the promo code “FD10BET” when registering. Depending on your country of residence, there are different turnover requirements to clear your bonus. You need to turnover your bonus amount between 5-8 times before it can be withdrawn. Players from United Kingdom, Austria, Denmark, Finland, Sweden, Norway, Japan, Canada, Switzerland, Luxembourg and New Zealand are entitled for 50% up to €100 or currency equivalent, and the conditions to withdraw are: deposit + bonus x 5 on odds of 1.60 or more. Players from Russia and Slovenia are entitled for 50% Up To €100 or currency equivalent, and the conditions to withdraw are: deposit + bonus x 8 on odds of 1.60 or more. Players from the rest of the world, are entitled for 50% Up To €100 or currency equivalent, and the conditions to withdraw are: deposit + bonus x 8 on at least 3-selection combo bets and with at least 1.60 odds per selection. Players from Poland and Ukraine are not eligible for this specific offer (for Polish customers they have a special 50% up to 100 PLN / 50 EUR). Minimum deposit of €20 applies. 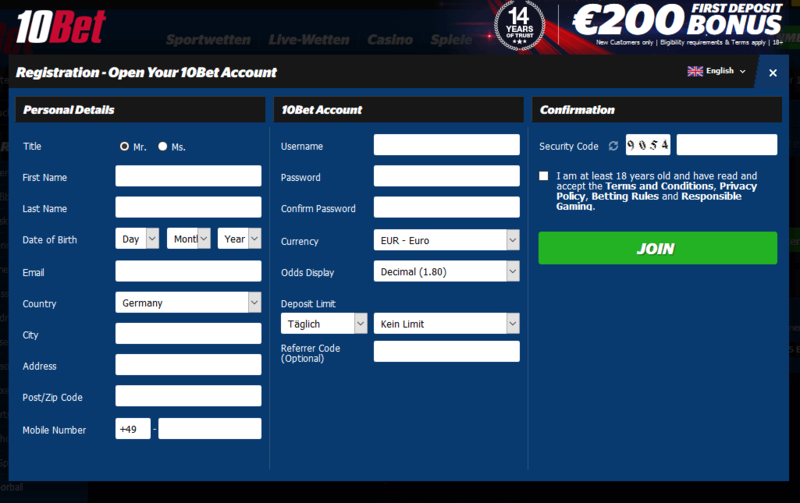 Our following step-by-step guide will show you how to easily set up your account within a few minutes and benefit from our fantastic €100 Betting Bonus Offer. Once your account is created you can start to deposit money. Simply choose your preferred payment method, your currency, and follow the instructions on the screen to finish the deposit process. 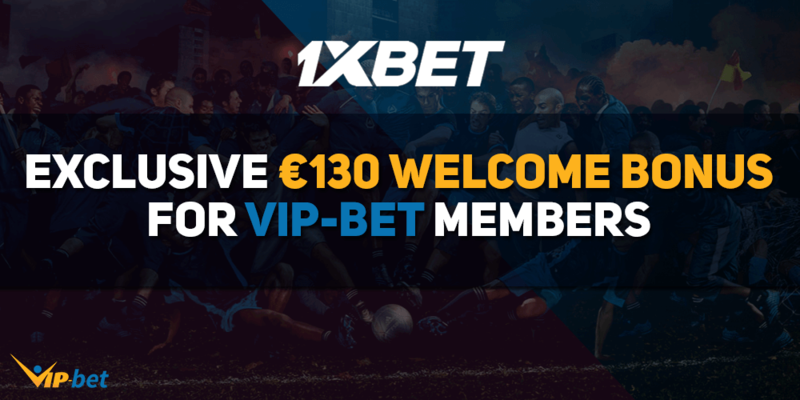 Make sure to use the code “FD10BET” to become eligible for our €100 Betting Bonus Offer and all other benefits. 10Bet offers great market coverage and you will find all key sports including almost all betting markets. 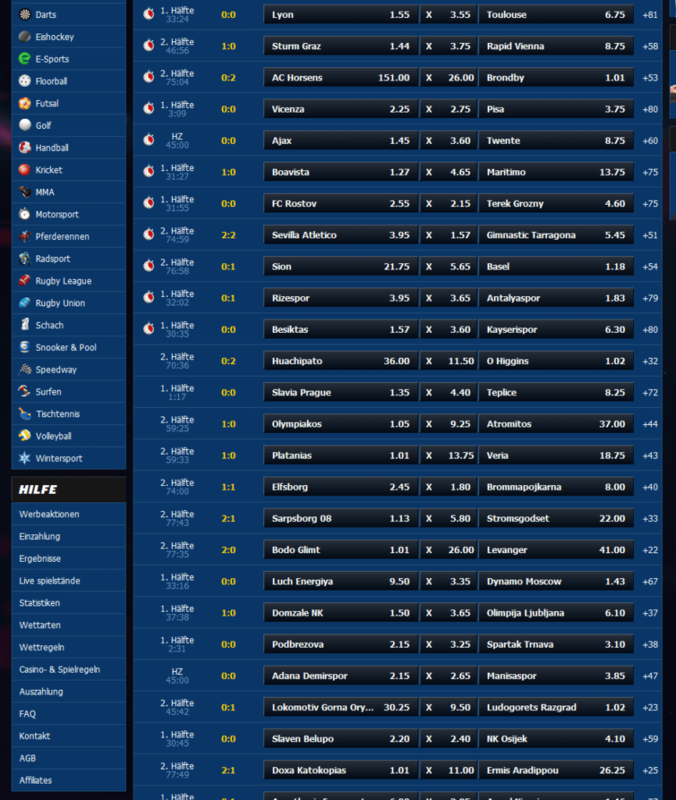 Even smaller soccer leagues can be found which makes 10Bet to a great choice for all sportsbetters. 10Bet has been around for many years now and has increased their betting markets a lot. Even eSports betting fans will find a great place to bet at 10Bet, but for more details about that please check our detailed 10Bet eSports Review, where we have focused on this fantastic new and steadily growing market. When it comes to betting odds, 10Bet is good in general. They offer highly competitive odds, but they also publish their odds early. This can sometimes allow you to jump the gun on others in the industry and place your bets before others release their offers and the odds start to drop. 10Bet also offers odds for some betting lines you won’t find at other sportsbooks. 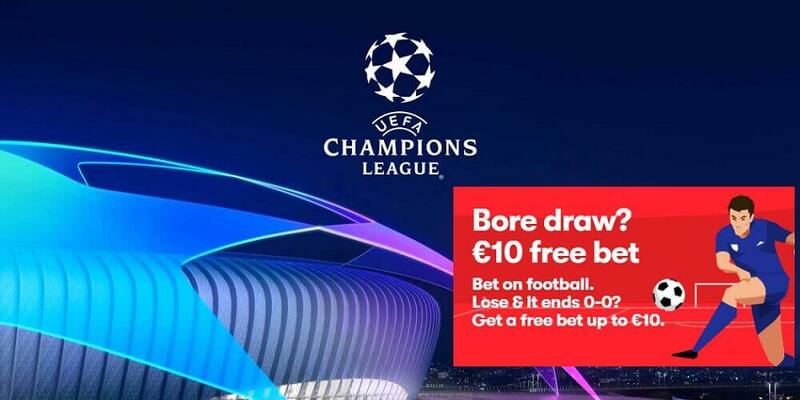 10Bet also offers enhanced odds from time to time. However, if you are looking for better enhanced odds you need to take a look at some other sportsbooks and also check our enhanced odds page for a summary of the best and most profitable offers for you. Even if 10Bet is one of the best when it comes to odds, you still should always compare before placing a bet to not miss any value. 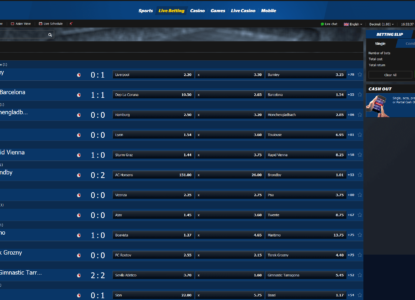 With our Odds Comparison Page, where we provide an overview about the best odds for different events through different sportsbooks, you can easily find the most profitable sportsbook to place your bets. Give it a try and see how easy it can be to maximize your winnings by just picking the best site to place your bets. 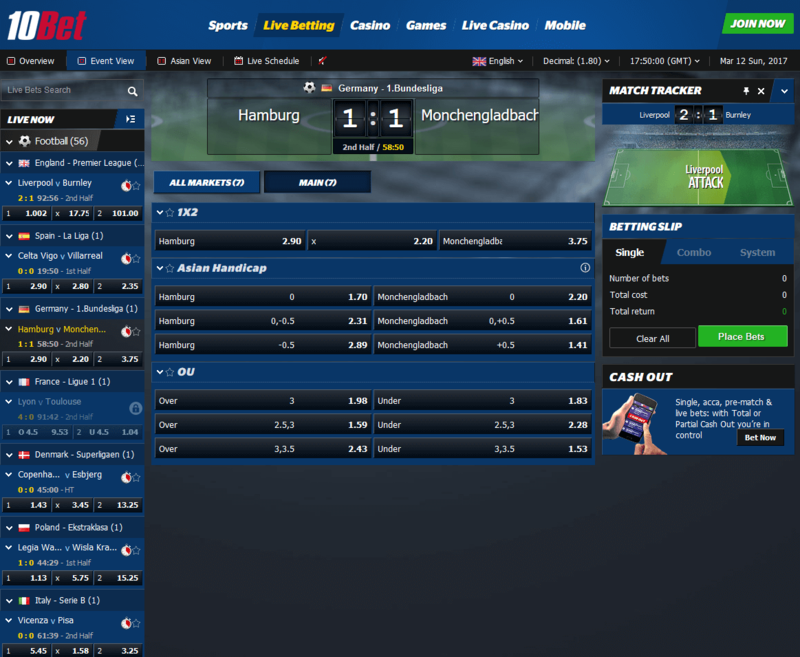 Since almost everyone is using a mobile device like a smartphone or tablet, live betting has become even more popular. Follow your favorite team no matter where you are right now and take every chance to place some profitable bets. 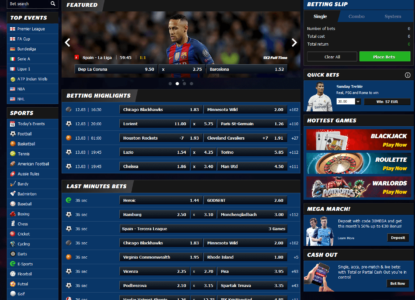 10Bet offers live betting markets for most of their markets and if you did not try live betting yet, give it a try – 10Bet is definitely a good place to start at. Unfortunately, 10Bet does not supply live streams to watch the game as you bet at this time. Please take some time to also check out our sports live betting page for more information and details about live betting in general and the best live betting sportsbooks. Start In-Play Betting at 10Bet! 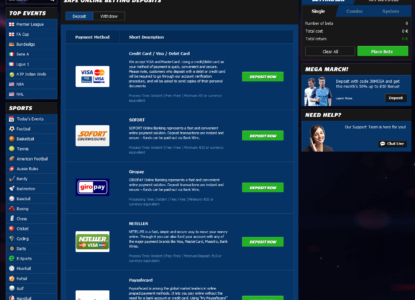 10Bet offers a decent range of payment options, so that every customer will find a way to easily deposit into their sportsbook accounts. The following table gives you a quick overview about the most important payment options and their fees and limits. 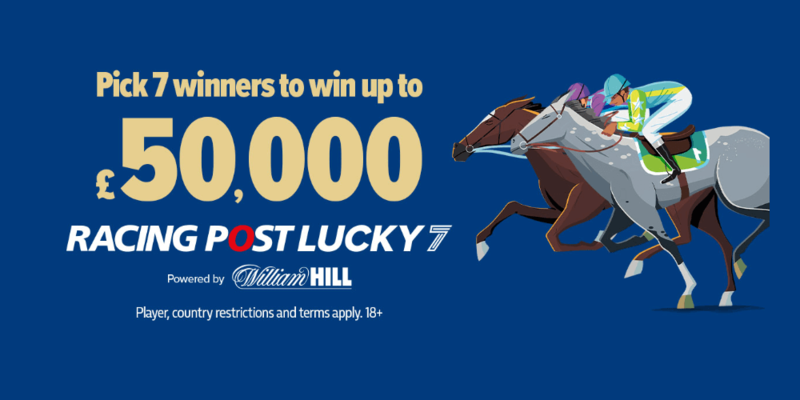 10Bet is offering regular promotions for its customers and offers all betters the chance to maximize their winnings with some additional value. Check the following overview to find some of the current running promotions and make sure to check them on a regular basis to not miss anything new. Mega March – Grab an up to €30 Reload Bonus with the Mega March promotion. Acca Jacker – Score enhanced winnings on football and grab up to 60% extra cash. 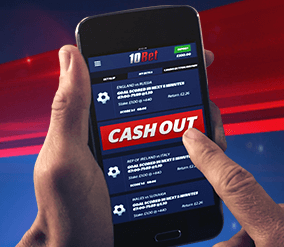 Cash out your bet – Cash Out gives you full control of your Single and Acca bets, allowing you to collect your winnings before an event has finished. 10Bet opened its doors in 2003 and is regulated by the UK Gambling commission. Operating in over 90 countries, they offer their website in 18 different languages with a wide range of currencies. In 2012, 10Bet won the award for Best Online Betting Platform at the Balkan Entertainment and Gaming Exhibition, also known as BEGE. In the same year they also launched the mobile version of their website, which helped them to attract even more customers by providing their services for mobile devices as well. In 2013, 10Bet was nominated for Best Sportsbook at the eGR Operator Innovation Awards. In the same year their sportsbook was established, they also launched their affiliate program, which was another big step to keep their business growing and bring more customers to their platform. On their website they offer affiliates the chance to bring new customers to their sportsbetting and casino platform and therefore offer them a commission for every new referred customer. Affiliates will earn a share from both casino players and betters and can choose between a revenue share commission or a master affiliate commission. 10Bet offers a commission between 10 – 50% to motivate their affiliate to do their best to bring new customers to its platform and keep their business growing. 10Bet’s affiliate program has been nominated for best affiliate program in 2013 and 2014. 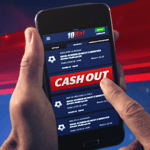 10Bet offers a mobile app for all Android and iOS devices. Through those apps you will be able to enjoy the full 10Bet sportsbetting program without any restrictions. Fund your account, withdraw your winnings, place live bets, or just check your history and profits from the past in your overview. Downloading and install the iOS app to your mobile devices is easy. Just click one of the following logos and download the app to your mobile device. To download the Android app just click the following button and follow the instructions on the 10Bet Mobile website. Please note, you will also find several other sources where you can download the android app, but we would highly recommend to not use apps from an unknown source and only use the app from the original app from their homepage. Odds Format: Fractional, decimal odds, american format. 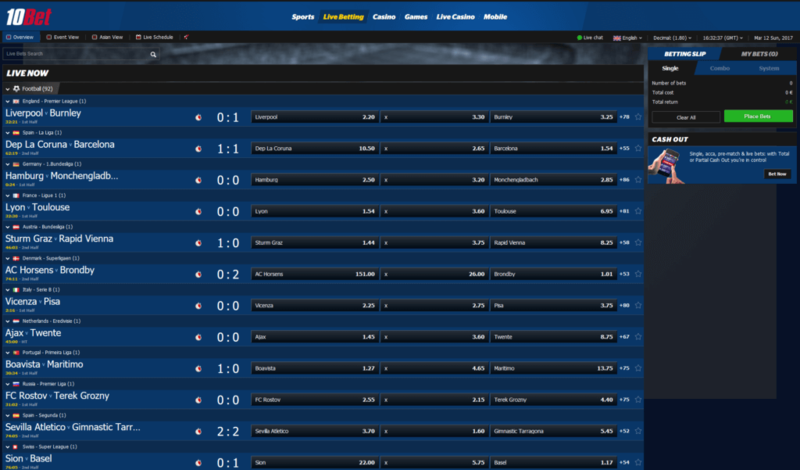 Live Betting: Pretty good market coverage with a lot of betting options. 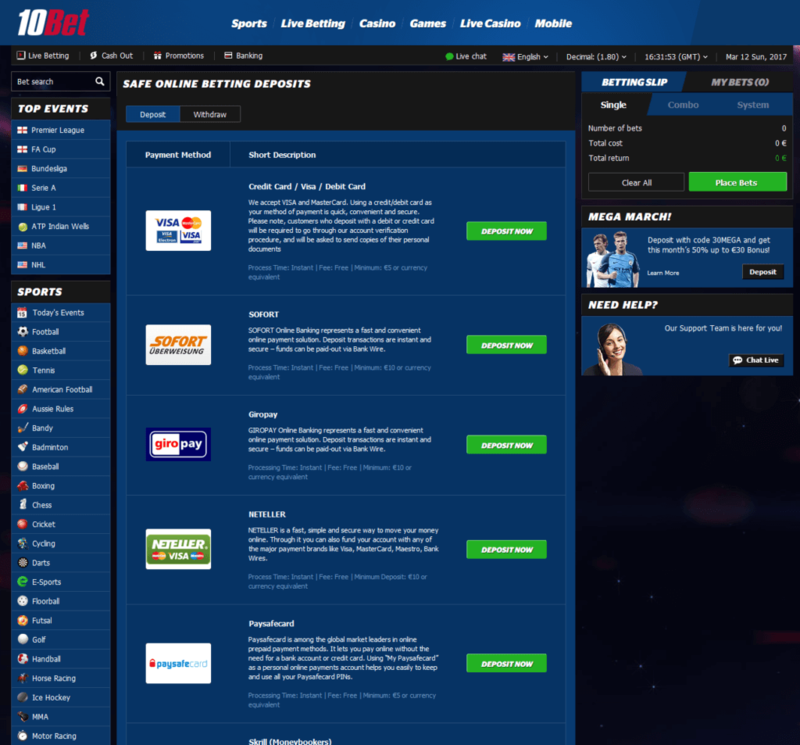 10Bet is available worldwide and only clients from a few countries are not allowed to open a 10Bet account. Check the following overview to see all regions where you are not allowed (orange) to open a 10Bet account and where you are allowed (blue).